Dia de los Muertos in Houston! Dia de los Muertos/Day of the Dead altar at one of the campuses I work at. Dia de los Muertos is a holiday celebrated by various Hispanic and European communities, although now a days becoming more popular in the US. It is a day where we celebrate our dead relatives, young and adult spirits. During this holiday, altars with “offerings” are put together by families for their loved ones who have passed away. Offerings include food, candy, water, and even booze for the older souls. Legend says the gates of heaven are opened for the younger souls, los angelitos, on October 31 at midnight. The more adult souls come to pick them up later in the evening of November 1st, where they get to celebrate and reunite with their families in a spiritual way. Although I have never celebrated the holiday, I adore the concept of celebrating our dead ones. Death is a sad concept here on earth because we are left with unbearable wounds and memories of those who have left us. But, the Day of the Dead adds a positive spin to death in a way nothing does. It reunites families with loved ones in a spiritual way that requires tons of meditation, creativity, and good purpose while healing ones heart. The picture you see above is from an altar I came across in one of my campuses (I am somewhat of a teacher during the day). 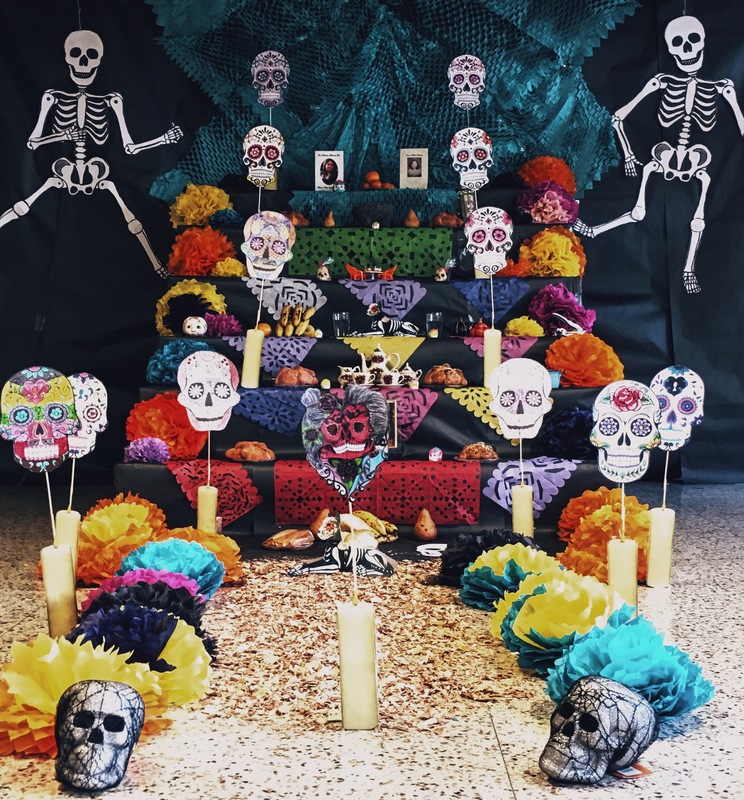 Students and faculty put this altar together to celebrate their dead ones. I absolutely fell in love with it. They had candy, bread, fruit, and flame-less candles. I hope this short post gives you a bit of an insight of a holiday with so much emotion, creativity, and love. Have you ever celebrated Day of the Dead?